Bonnie is the driving force behind Owyhee Media. She began her advocacy to preserve the Owyhee region with the publication of her book, The Owyhee River Journals, in 2012. Her journals, combined with Mike’s 125 full color photographs of rarely seen landscapes, will allow readers to take a vicarious journey into the canyonlands of the Owyhee River in Nevada, Idaho and Oregon. That same year Bonnie launched Owyhee Media, the business created to distribute the book, and as a point of contact for her educational presentations on the Owyhee Canyonlands, which began in 2013. The public is being asked to make a decision about the future of the Owyhee region with little visual or personal knowledge of the area. It is crucial to see it in order to understand what’s at stake and to make an informed decision regarding the preservation of this magnificent desert country. Her richly-illustrated book, dvd and presentations address this deficit of information. Bonnie brings a level of professionalism to her presentation that is appreciated by the hosting venue. 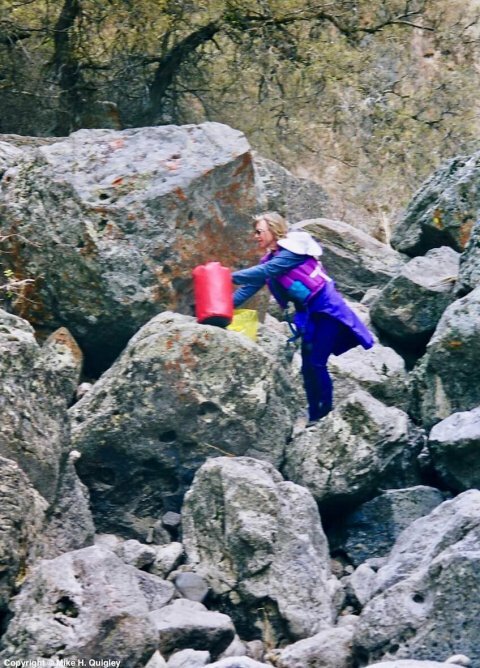 She is passionate and knowledgeable about her topic and eager to share the natural beauty of the Owyhee with her audience.